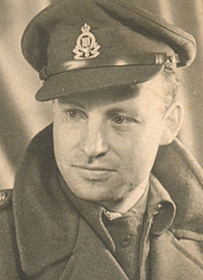 Captain Proctor Clifford Neil ~ MC, MEIC ~ was commanding officer of 54 Light Aid Detachment (LAD), Royal Canadian Electrical and Mechanical Engineers, attached to the Sixth Canadian Armoured Regiment (First Hussars ~ a London, Ontario unit). He arrived in Normandy on D-Day: June 6, 1944. Captain Neil and his crew, supporting the First Hussars, arrived at 9 am and were part of the first group of Royal Canadian Electrical and Mechanical Engineers to arrive in Normandy on D-Day. 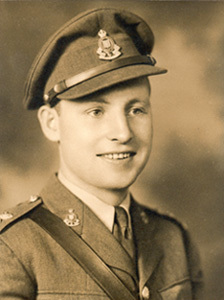 He was subsequently awarded the Military Cross for his courageous actions during the North-West Europe Campaign: In 1945, while under heavy fire, Captain Neil and his men recovered 51 tanks that were stranded in a muddy minefield. Captain Neil understood the importance of recovering these tanks and acted on his own initiative. The retrieval efforts were done without covering fire or the use of mine detectors in a heavily mined area subjected to enemy artillery, machine gun & sniper fire. Captain Neil showed a "complete contempt for danger" recovering the 51 tanks under perilous conditions. To commemorate Captain Neil's accomplishments, a new $17.5 million maintenance building at Wolseley Barracks in London, Ontario was named in his honour on May 10, 2006. At the building's opening ceremony, Brig. General Guy Thibault, commander of Task Force Central, stated that Captain Neil "represents the best of what Canadian Forces represent." Another notable piece of information about Captain Neil's military life concerns the Holy Roller Sherman tank that was used by the First Hussars in WW II: Captain Neil was responsible for this tank coming to Canada after the war in Europe ended. It is currently located at Victoria Park in London, Ontario. The Holy Roller, and two other First Hussars memorial tanks (Bold at Courseulles-sur-Mer, France and Calamity in Sarnia, Ontario), is dedicated to the regiment & the Allied men who fought in Europe. Captain Neil was born on August 21, 1914 in Cobalt, Ontario. He grew up in North Bay, Ontario, excelling in both academics and athletics. After serving in WW II, he moved to Montreal, Quebec to attend McGill University and graduated with a degree in Metallurgical Engineering on May 28, 1947. Captain Neil later relocated to Niagara Falls, Ontario with his wife Patricia. After working in industry until age 65, he established a consulting company and continued to work for another 10 years. Captain Neil died on August 18, 1991 in Niagara Falls, Ontario. He is survived by his two sons, plus several grandchildren and great-grandchildren. Captain Neil had a never-ending quest for knowledge, and he was extremely proud to have served his country in the military.